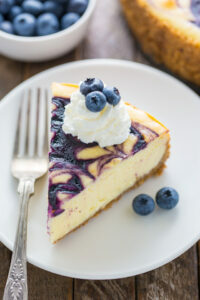 Rich and creamy White Chocolate Blueberry Cheesecake! I’ve been so obsessed with mini cheesecakes this Summer that I almost forgot how incredible REAL full-size cheesecake is. Just one bite of this White Chocolate Blueberry Cheesecake set me straight! 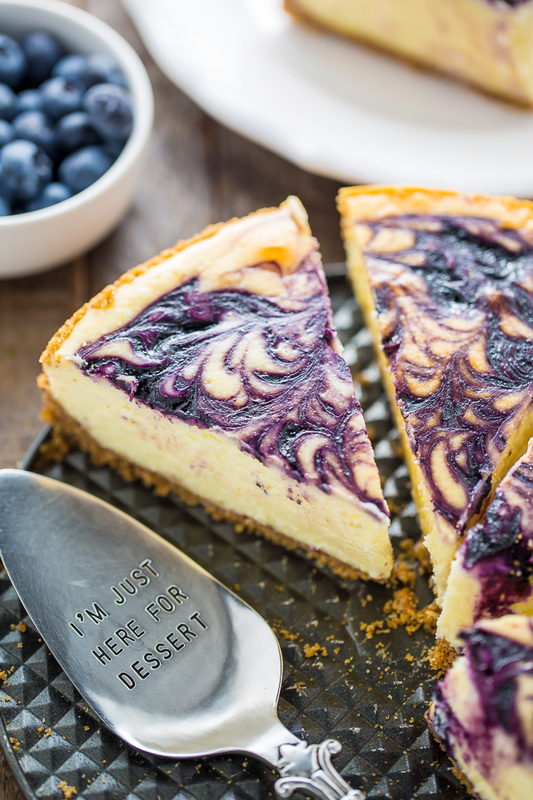 Each ultra creamy slice is swirled with fresh blueberry, exploding with real white chocolate flavor, and lightly spiked with a pop of lemon juice to balance everything out. I’m not being one bit dramatic when I tell you it’s simply divine!!! 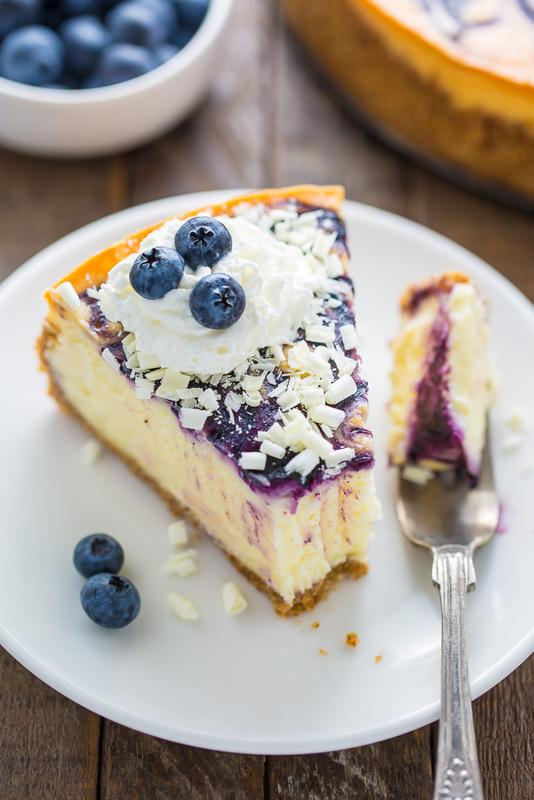 This white chocolate blueberry cheesecake has been a dream of mine all Summer! I like to think of it as my White Chocolate Raspberry Cheesecakes delicious little brother. The core of the recipe is almost exactly the same – with just a few key changes! That’s one of the cool (and sometimes scary/frustrating) things about baking; just a few little changes yield BIG results. In case you’re curious, here are the changes I made: I chose to use a traditional graham cracker crust instead of an Oreo crust; I swapped the raspberry swirl for a blueberry one; and I decreased the amount of lemon juice to just one and half tablespoons. I also used reduced-fat Greek yogurt instead of sour cream. Less calories but just as creamy. YES!!! P.S. I brought this white chocolate blueberry cheesecake to a BBQ last weekend and it was literally gone within the hour! And there were only 7 of us… and 3 were on “diets”. A springform pan is required for this recipe. If you don’t own one already, click here and check out the one I’ve been using for years. This recipe also requires a water bath. A water bath is a term bakers use when they place a baking pan (in this case, a springform pan) into a larger pan that’s been filled with hot water. This extra step helps insulate the pan from direct heat on all sides while it bakes. The water bath method helps your cheesecake bake slowly and gently, ensuring the finished product doesn’t burn, curdle, or crack. It also helps the cheesecake maintain its silky smooth texture. When it comes to choosing a pan for your water bath, pick one that is as tall as the cheesecake pan and large enough to leave a few inches between the cheesecake pan and the outer rim – you want enough room for the water to circulate easily. When you’re ready to make your water bath, here’s what you do: Adjust an oven rack to the middle position. Preheat oven to called for temperature. When the oven is preheated, carefully (using an oven mitt) pull out the middle rack (just a little bit) and place your large pan on it, fill the pan half way with hot water, then place the filled cheesecake pan in the center of the water bath. Slowly slide the rack back to its full inserted position, close the door, and bake the cheesecake according to instructions. Since this recipe uses a spring form pan, it is essential to wrap the pan in heavy-duty tin foil to avoid water seeping in. I wrap my pan from every possible angle pressing the foil in and around to prevent a soggy crust. You want at least 6 layers of foil! You’re going to leave the cheesecake pan in the water bath, even after you turn off the oven. You’ll take the cheesecake out of the water bath once it has been removed from the oven and has cooled down enough to touch it without burning your hands. Your blocks of cream cheese MUST be very soft before you make the batter. I suggest placing them out on the counter for at least two hours before you plan on baking. If you attempt to blend cold cream cheese it will most certainly clump up, and won’t develop into a smooth, uniform batter. It may also harm your blender or food processor. You’ll also want to bring your eggs, egg yolks, and Greek yogurt to room temperature. Batters made with cold ingredients don’t come together smoothly. To make the the blueberry swirl you’ll need to first make a blueberry puree. You’ll begin with one and a half cups of blueberries and cook them down until the mixture has reduced to a 1/3 cup. You’ll need a fine-mesh strainer to make the blueberry puree. You’ll place the strainer over a small bowl and push the puree though. You’re only going to use the juice in the bowl. You should have about 1/4 cup of liquid in your bowl. 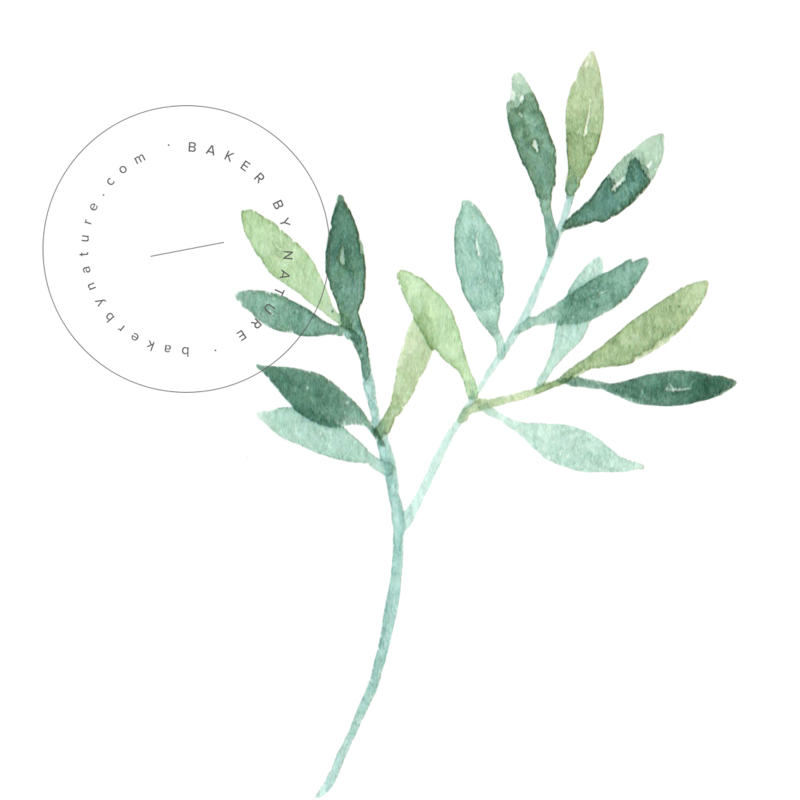 Discard any skin or seeds left in the strainer. 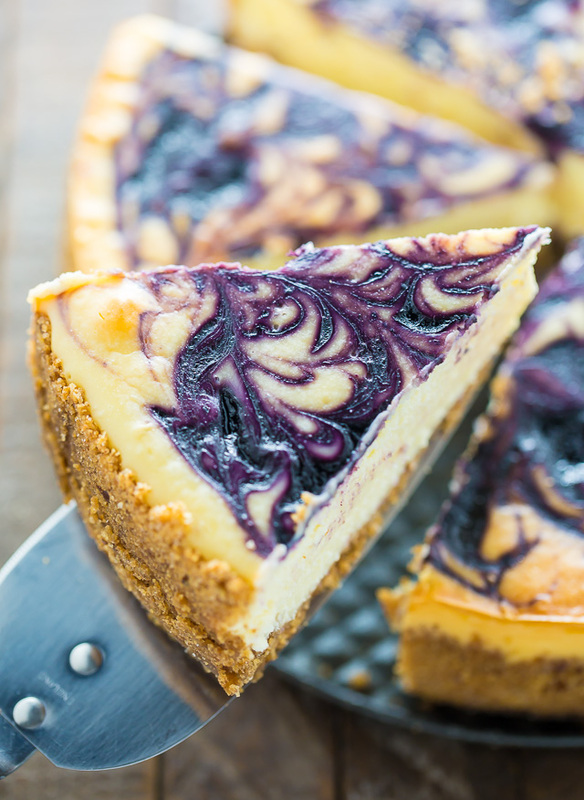 Make sure your blueberry puree is completely cool before swirling it on top of the cheesecake. 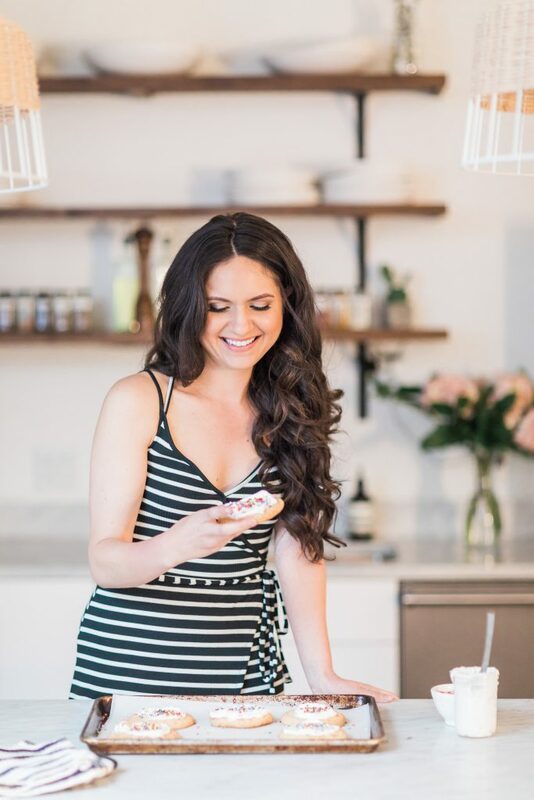 The puree typically takes 20 minutes to cool (in the fridge), and can be made up to 2 days ahead of time – and stored, covered, in the fridge – until needed. The white chocolate will need to be melted and slightly cooled, about 10 minutes or so should do the job. I recommend using a white chocolate you know melts well. I used Lindt white chocolate with great results, but any high-quality brand will work! Just be sure not to use white chocolate chips. The texture and flavor will not be the same! 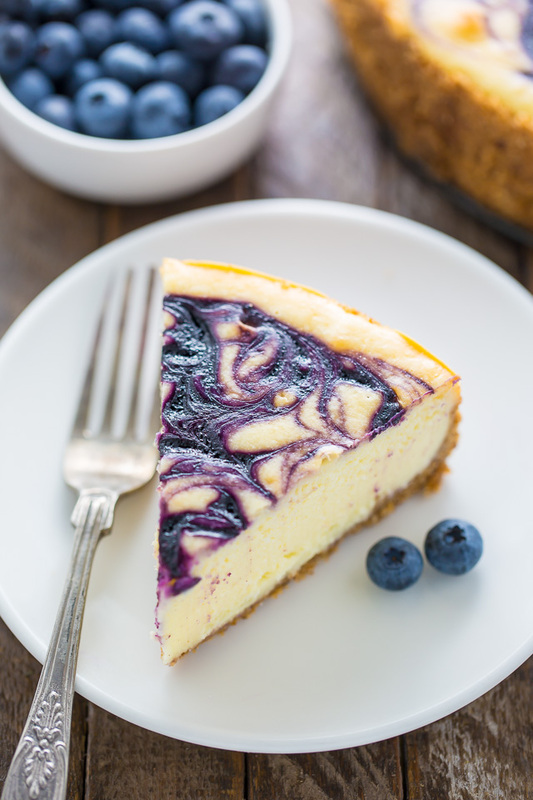 This white chocolate blueberry cheesecake must cool for a full 6 hours before slicing, so be sure to plan ahead! The good news? It can be made up to 3 days in advance and stored in the fridge until needed. This white chocolate blueberry cheesecake also freezes great! If there’s anything I didn’t cover above, feel free to ask me in the comment section below! 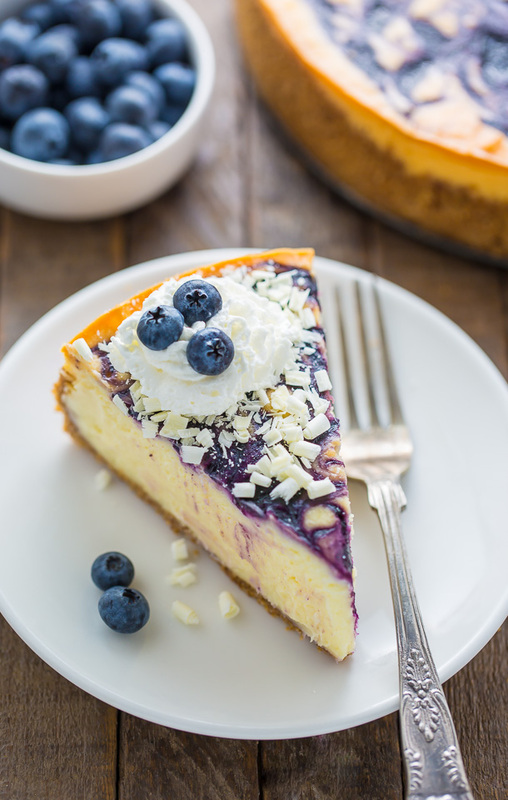 White chocolate blueberry cheesecake for the WIN! Preheat oven to 325 degrees (F). Lightly spray a 9" springform pan with non-stick baking spray (or grease it with butter and a light sprinkle of flour). Wrap the bottom and sides of the pan with several layers of heavy duty tinfoil (I highly recommend doing several diligent layers here to ensure no water seeps though to the crust). In the body of a blender or food processor, combine the graham crackers, sugar, and salt; pulse until the crackers have been completely transformed into fine crumbs. Transfer crumb mixture to a large bowl; add in the melted butter and stir well to combine. Press the mixture into the prepared pan, working from the center and up the sides. Bake for 8 minutes. Place crust on a wire rack to cool while you prepare the filling. Beat the softened cream cheese and Greek yogurt in a blender or food processor, scraping down the sides as needed, until completely smooth. Add in the eggs, egg yolks, and sugar; pulse until well combined. Add in the flour and vanilla and pulse for another 30 seconds, or until the flour has completely disappeared into the batter. Don't over mix! Using a rubber spatula, fold in the lemon juice and melted white chocolate, stirring gently until combined. Pour the filling into the prepared crust, spread evenly, and smooth the top with a rubber spatula. Top with dollops of the blueberry puree and gently swirl with a skewer or toothpick for a marble effect. Place the springform pan into a large baking pan (with high sides) and fill the pan halfway with hot water; this is your water bath (see post if you need more information on this). Place cheesecake in preheated oven and bake for 1 hour and 30 minutes. Turn the oven off and let the cheesecake sit for 45 minutes, inside the oven, with the door shut. The cheesecake should still be slightly wiggly in the center. Remove from oven and gently run a knife around the edge of the cake, loosening any bits that may have gotten stuck while baking. Allow cheesecake to rest on the counter for 30 minutes before covering with plastic wrap and refrigerating for at least 6 hours. When ready to eat, simply slice, top with a dollop of whipped cream, and serve! In a small saucepan combine blueberries and lemon juice; bring to a simmer over medium heat and cook, stirring constantly and gently smashing the blueberries smooth, until thickened into a deep, dark blueberry reduction, about 10 minutes. Remove from heat. Place a fine-mesh strainer over a small bowl and push the puree though, leaving any skin/large chunks behind. Allow mixture to cool completely before using. When ready to use, follow instructions above. For best results, recipe should be followed exactly as written. Blueberry puree can be made 3 days in advance and stored, covered in the fridge, until needed. Cheesecake will keep, stored and covered in the fridge, for 5 days. 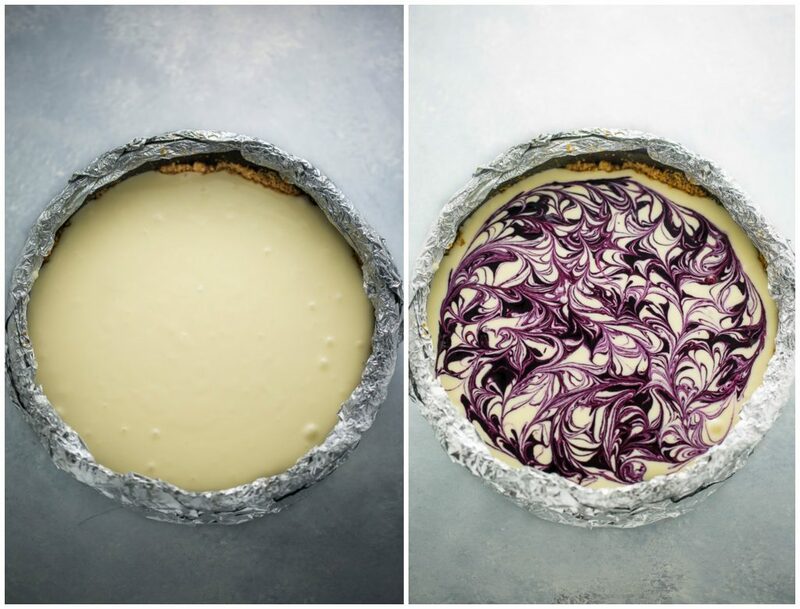 Cheesecake may also be frozen for up to two months. Thaw fully before serving. The blueberry swirl on top is so pretty! This sounds marvelous! How gorgeous is this?! 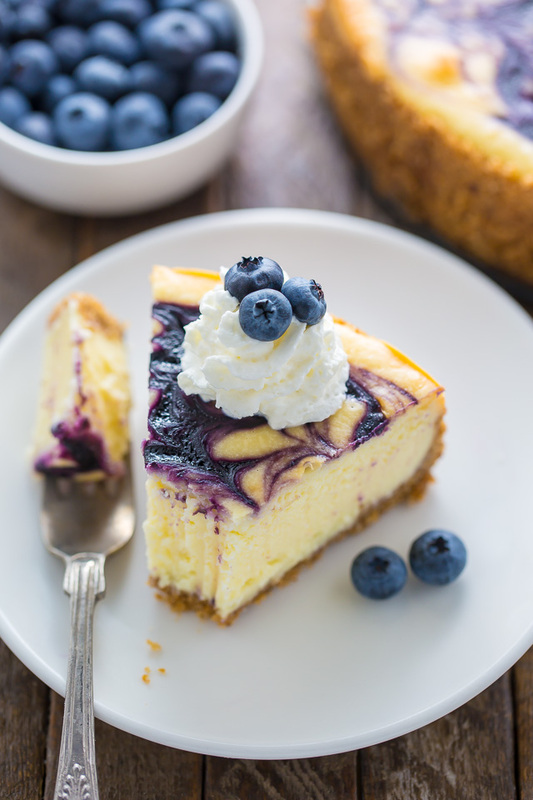 I’m a huge fan of blueberry, white chocolate and cheesecake so the combination of all three is pretty much the best thing ever! THAT SWIRL!!!!!!! soo beyond dreamy, I’m in love! I love the blueberry swirl! And thanks for all the tips on keeping it from cracking, that has always been my biggest hurdle when it comes to a full-size cheesecake. White Chocolate and blueberry !!! Mummy!!! This looks so amazing , is it possible to make this without eggs ? What size springform pan did you use?